Casting a moon spell to capture the romantic interest of Justin Rokoff seems crazy to college psychology student, Sabina Clair, but when she overhears a conversation about the powerful success of a Celandrium Shop love spell, Sabina decides to take drastic measures to attract Justin, her love crush since starting college. She visits the mysterious Celandrium shop and purchases the archaic spell. Sabina casts the spell at the next full moon and waits anxiously for its effects, which are very quick. The bliss of Justin’s immediate and undivided romantic attention very soon turns to dread when the antique spell works too perfectly and Sabina finds herself desperate to undo an irreversible spell. Surprise twist ending! The Everlasting Spell is a curious, paranormal, urban tale that will entertain you magically! I found this to be a quick, entertaining paranormal romance, which also contains magic, humour and an underlying sense of menace. It is essentially a modern day fable, which warns the reader to be careful what they wish for! The story was very realistic in how it portrayed the thoughts and actions of the heroine Sabina, as she goes about her life at college and her attraction to Justin, the college hottie. This contrasted nicely with the scenes which described the strange and magical Celandrium Shop and the Everlasting Spell which she purchases. I particularly liked the scenes in which Sabina invokes the spell and the descriptions of the mysterious shop and the shopkeeper. Whilst Sabina is thrilled when the spell is a great success and she gains Justin’s attention, she begins to have second thoughts….. Yet what is a girl to do when powerful moon magic has been invoked? 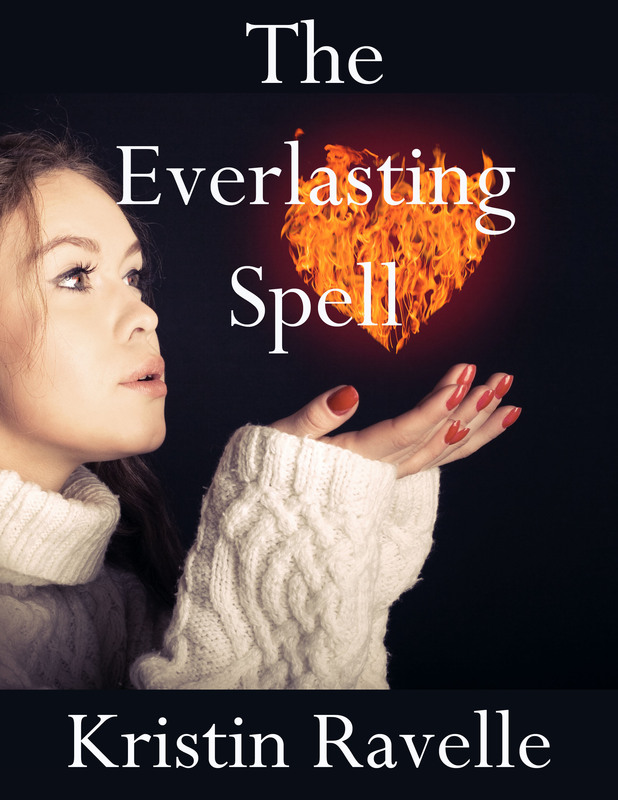 Can the spell be stopped or reversed or will she be the recipient of Justin’s increasingly obsessive attraction to her forever? I will not reveal any more, but suffice to say that there is a twist to this engaging tale, which will appeal to lovers of romance and the paranormal alike. This entry was posted in Fantasy, New Adult, Paranormal, Review, REVIEWS (ALL) - Reverse Chronological Order, Romance, Urban Fantasy and tagged kristin-ravelle, magic, obsession, the-celandrium-shop-tales, the-everlasting-spell. Thank you for your review of my novelette. As there is a new moon this morning, Friday, March 20, this is unusually coincidental timing! Good luck with the release Kristin. I loved reading about the moon magic spell!